I flew my red Extra this week. The thing is just plain awesome on 4s. We'll get some video soon. In Florida we fly just about all year round. We generally lose a week or two in January but once the winds drop below 20 mph we are out there every day. 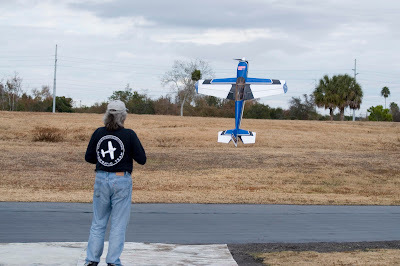 You don't want to miss a perfect day, so you have to be ready, including back up planes. 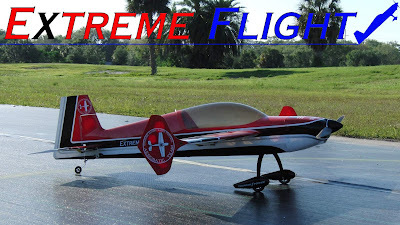 That, and the EXTREME FLIGHT EXP series are such nice airplanes that I never want to be without any of them. I had a little recovery time this winter, so I spent it on building up two of each EXP. I lost one in the process due to bad luck (stupid flying), and that set us back, but yesterday the fleet was completed when I tested my new Extra 300 EXP back up plane. This is the sister ship to the blue one I have been enjoying so much. EXP design and construction assures that every Extra EXP will fly virtually the same as any other. Sure, there are going to be differences because you are dealing with woods and glues, and most obviously, humans who are building them, but production tolerances are so tight that once you get used to how an Extra EXP flies, you know just about what to expect from the next one. 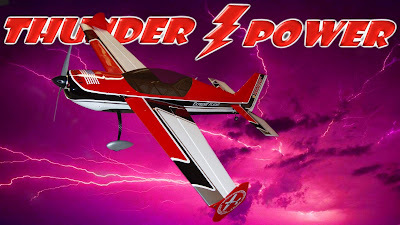 I needed one lap to check the trim, and with a notch of up and a notch of right aileron, we were set to go into my extreme aerobatic routine. Short version: I knew what I had with this plane right away. I love the way my EXP planes look. They are a completely different style from what I was used to looking at before. The have big, long, tall, fat fuselages, an elongated canopy, and huge tail surfaces with giant side force generators (SFG). While these are 48" wing span, everything about the EXPs is big, so much so that most people think these are larger airplanes than they really are. Most people guess they are 55" planes. Look how high the tail sits off the ground. Even the tail wheel is about twice as big around as the competition's wheel. These are just big planes, but I can still fit any of my EXPs in the back seat, or the trunk of my car without taking the wings off. From a personal standpoint, this is as big of an airplane as I can get that is still totally practical. A lot of manufacturers build an Extra and make it look like an Extra, even at the expense of the flying suffering. Extreme Flight won't do that because the flying is far and away the most important thing. They will build an Extra, or an Edge, or an MXS, but if something needs to be changed to enhance performance, it gets done. Not so oddly, here we can apply the time proven principle of form follows function. 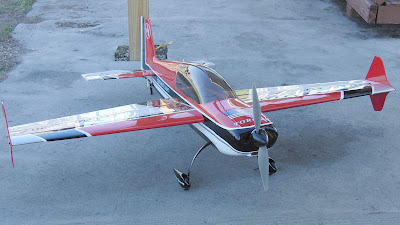 If you build the plane to fly first, the shape will follow and that is exactly what has happened with the EXP series. For stability, you want a long tail, so that is what the EXPs got, and for agility you need big controls, so that is what the EXPs got. Whatever it took to make them fly awesome, the EXPs got. You end up with a plane that looks different. Now, though, we need to examine another time proven scientific principle: What works best is what looks best. OK, that's my own principle, but I believe it is true. Some ugly race cars go fast, but the truly dominant ones are always sleek and beautiful, much like the best airplanes. Sure, some ugly planes can fly good, but the ones that are in a different world, like the EXPs, have long, beautiful, flowing, sensual lines. The EXPs are simply awesome looking airplanes. In particular, the Extra EXP reminds me of a super sonic bomber, which makes it all the more fun to fly fast. It very much has jet-like lines, like you would see on something like a B47 Strato Bomber. 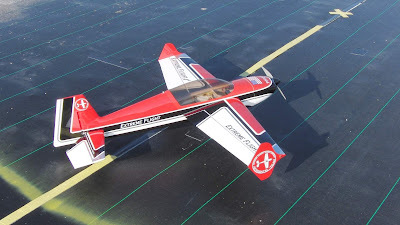 Perhaps it is my pattern aerobatics background that makes the long and sleek look appeal to me. Maybe it is the years of watching long and sleek sportscars dominate the international racing scene. Then again, maybe it is my preference for long, sleek women showing through. Whatever it is, I love the way these EXP series planes look, and I love they way they fly. I put my new red one away and brought out my older blue. I just like to have a pristine backup plane, and then I can hammer the primary with confidence. I've been flying the Extreme Flight Extra EXP for about 15 months and it just gets better and better every time out. I've crashed one and worn another out, and this is the newest one. Man, the red EXP was such a great plane. I flew it four or five times a week, five or six times a day for over a year. It just flew better and better every timwe out. Eventually, this one was getting scuffed up from the abuse and I like my stuff to look pristine, I sold it to a friend who is flying it every bit as hard s I did. Here's the new ride on it's second flight. So far it's been every bit as good as any of my other Extra EXPs, and I expect it to improve even more as the hinges wear in and the wood flexes in more. So far I am pretty estatic with it.